There are two basic types of bees in the UK – bumble bees and honey bees. Bumblebees can sting the victim numerous times and honey bees will sting you once and leave the sting inside you and die after that. All bee stings bring intense pain, but the damage done by these bites is minimal unless you don’t remove the sting for a long time or you are allergic to bees. When you notice a bee around you, stay calm because they tend to attack people who are making rapid movements. These insects look quite similar to bees, but they are more elongated in shape. They give powerful bites if they believe that they are at risk. Their stings result in swelling and itching. In most cases, wasp’s stings don’t lead to allergic reactions, but since they can sting you several times, it is not unusual to witness such reactions. Just like in the case of bees, in order to avoid problems, stay calm when you notice a wasp around you. Ticks aren’t really insects, they are actually classed as anthropods – the same as the spider family. However, they act like insects and look like insects. They can be found in thick grass, moors, and woods around the UK. Their bite doesn’t cause pain, but it can lead to many serious illnesses like Lyme disease. The best way to prevent tick attacks is to wear trousers and shirts with long sleeves when you are walking in forests or areas with thick and tall grass. These are one of the most annoying insects because of their buzzing and the itching they cause after they bite their victim. The good news is that UK mosquitoes don’t transfer any diseases, unlike other mosquitoes. There are specially designed repellents that you should use when you are out of your home during summer period at night, especially when you are camping. 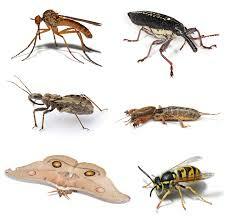 If you are experiencing any insect infestation problems and need advice, please contact us now.